I grew up in a house where marmalade was a staple of the table. My mother, MD, was mad for marmalade, and she would heap it on hot buttered toast at breakfast or at afternoon tea, or on crackers during cocktail hour. She loved marmalade so much that she would dip a spoon into a jar and eat it straight, licking the spoon clean. It turns out the apple—or, rather the orange—didn't fall all that far from the tree, as Reggie is intensely fond of marmalade, too. And he has been on a bit of a marmalade journey of late . . .
Until recently the only marmalade I ate or cared for was James Keiller & Son Ltd.'s Dundee Orange Marmalade, the world's first commercially made marmalade, which has been in continuous production since the company's founding in 1797. Thick, intensely flavored, full of rind, and verging on bitter, Keiller's Dundee Orange Marmalade has always been the marmalade I reach for when stocking my pantry. "Oh dear, bought marmalade. Dear me, I call that very feeble." 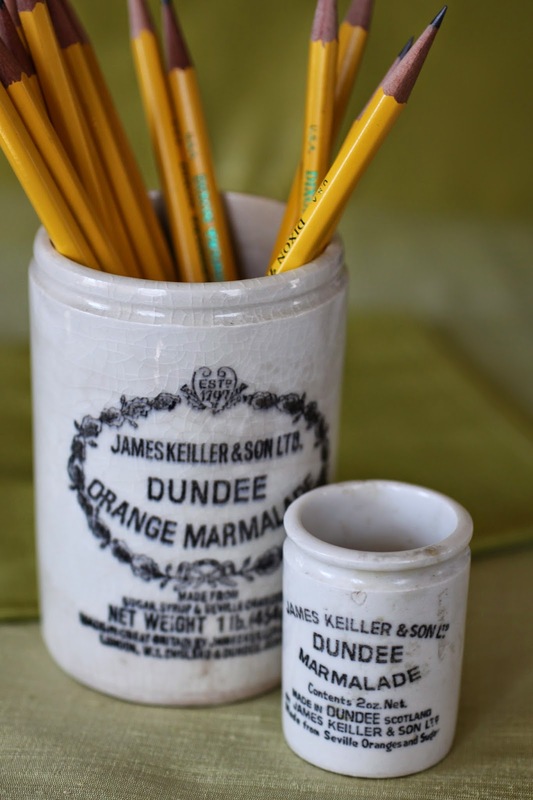 When I was a boy Keiller's Dundee Marmalade was sold in stoneware crocks that we saved when emptied of their delicious contents. We used the crocks to hold pencils and pens, which I still do to this day. By the time I went to college, though, Keiller & Son had dispensed with their handsome crocks and substituted the far less aesthetically pleasing milk-glass jars that are still found today on the shelves in supermarkets the world over. Keiller's old stoneware marmalade crocks are now considered to be collectibles and can be found for sale in Group Shoppes and on eBay. Two of Reggie's Keiller & Son Ltd. Although I've tried other commercially available marmalades over the years, including small-batch artisinal alternatives, none have inspired me to forsake the familiar embrace of my old standby, Keiller & Son Ltd. Dundee Orange Marmalade. That is, until I discovered the surpassing pleasures of homemade marmalade. 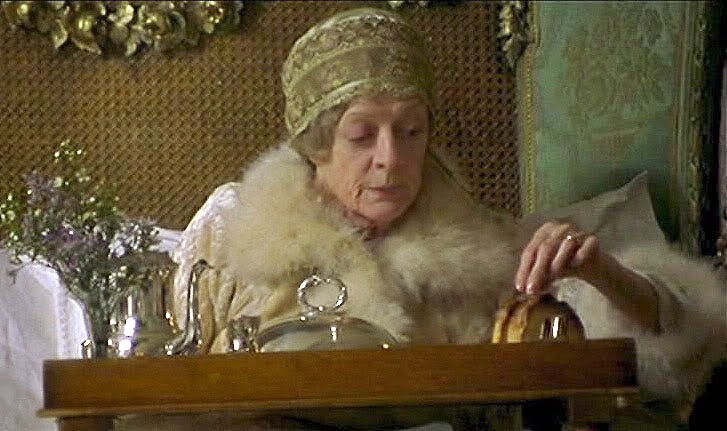 Once I had tasted it for the first time I vividly understood why the Countess of Trentham character—as brilliantly played by Dame Maggie Smith in Gosford Park—sat in her bed and sniffed "Oh dear" when confronted by a pot of "bought" marmalade on her breakfast tray. It turns out Lady Trentham knew of what she spoke. I found out exactly how sublime homemade marmalade is shortly before Christmas, when I received a jar of it in the mail. It was a thank-you gift from my childhood friend Katherine, who had recently stayed with us at Darlington. Katherine had made a batch of marmalade, her first ever. 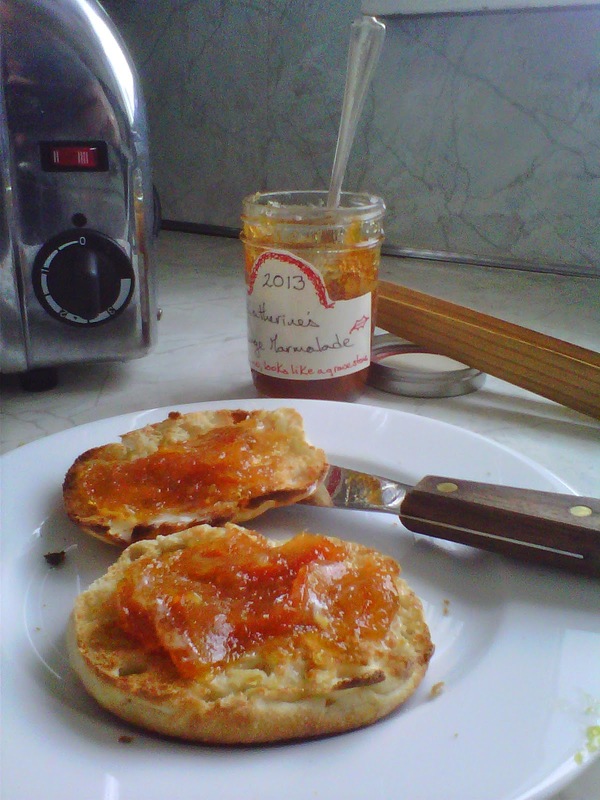 Tasting Katherine's marmalade was a revelation! Gorgeously orange in color, deliciously flavorful, packed with rind, and just sweet enough, it was infinitely better than my dear old Keiller's of Dundee. I polished off Katherine's marmalade tout de suite. And yes, Dear Reader, I even ate some of it with a spoon, just as MD used to do all those years ago. Fast forward to the New Year. 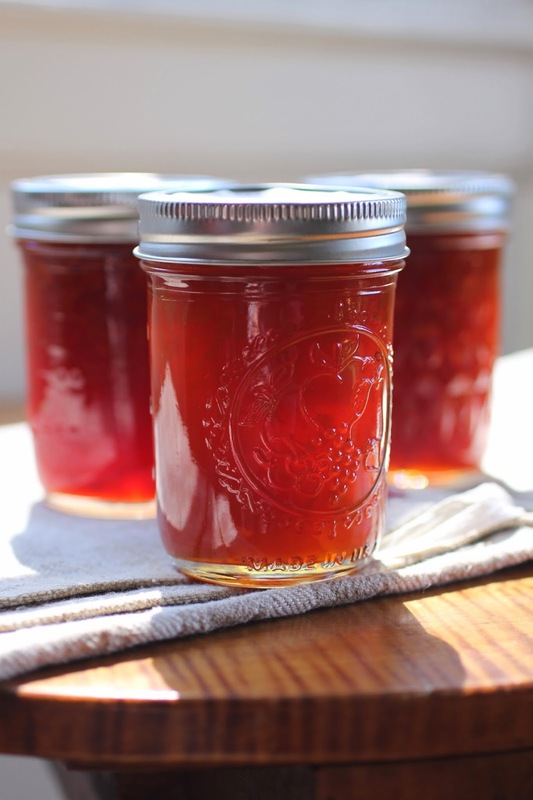 In early February I was perusing one of my favorite new blogs, Chronica Domus, where I was delighted to read of the writer's fondness for marmalade and her experience in making batches of it annually with her husband. I commented that I, too, adore marmalade. We exchanged emails, and the next thing I knew a package containing several jars of Chronica Domus' homemade marmalade was delivered to my door. 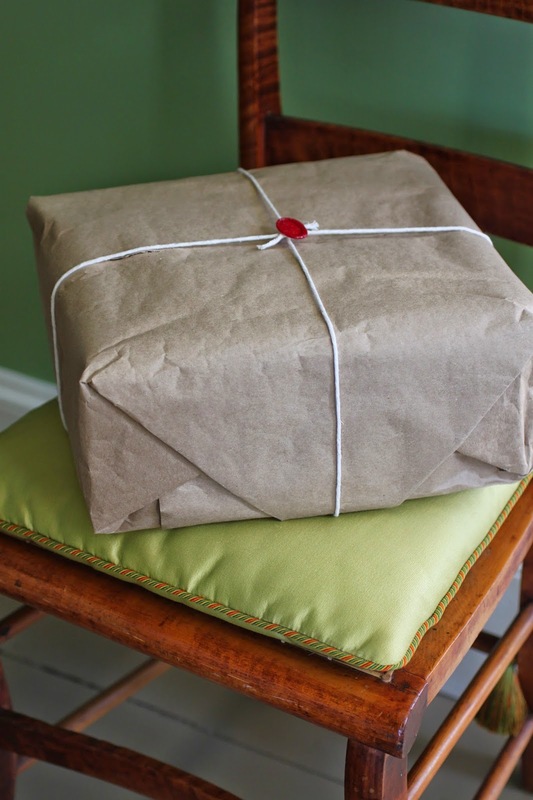 As I was about to leave for a week's holiday, and the package was delivered to my city apartment, I placed it in the refrigerator to preserve it while I was away. I wanted to open it at Darlington and make a record of it to post here for your reading pleasure, Dear Reader. Three jars of homemade marmalade! What Heaven! 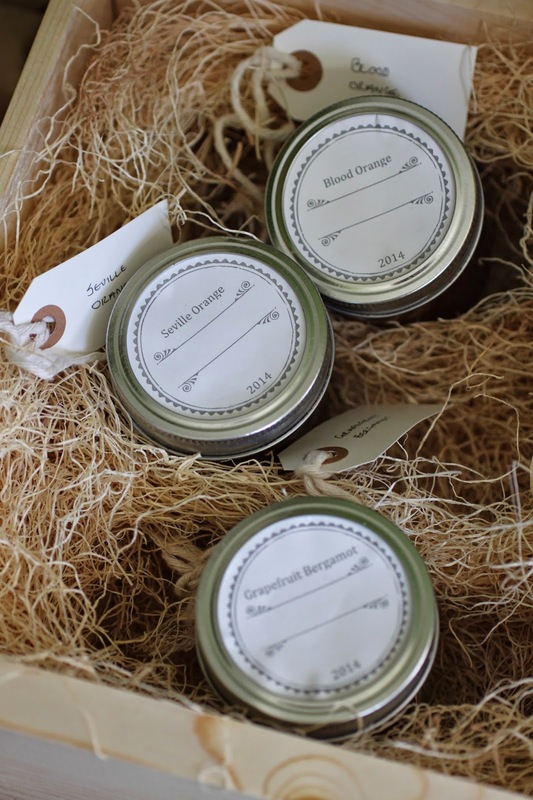 Blood orange, Seville orange, and grapefruit bergamot! Coincidentally, I had been considering making my own batch of marmalade. But I wanted to make it with kumquats instead of oranges, as we have a little kumquat tree at Darlington that bears fruit every January and February, and it had just produced a bumper crop of its tasty, zesty fruit. Last year I preserved our kumquat harvest in syrup, but this year I wanted to do something else. Having just received a jar of marmalade from my childhood friend Katherine, and now several more from Chronica Domus, I was inspired to try my hand at making kumquat marmalade. "Eureka!" 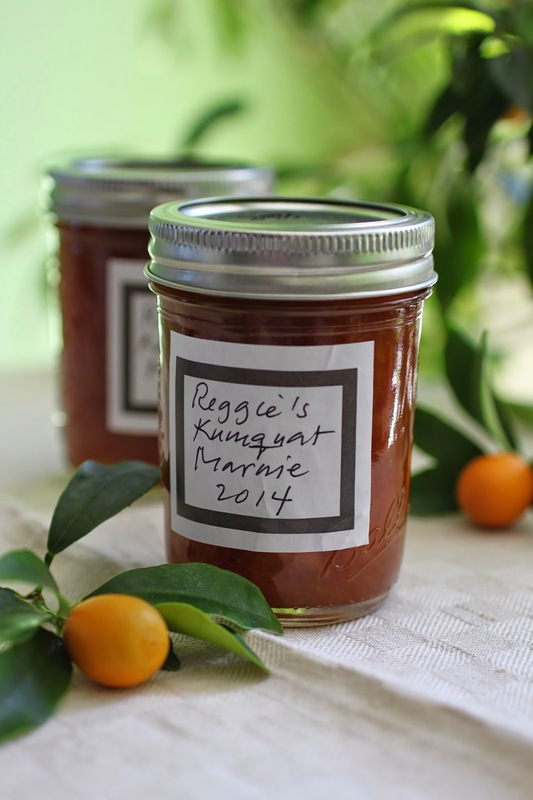 So, in the days leading up to our leaving on holiday, Reggie made a batch of kumquat marmalade. But he decided that he wouldn't call it marmalade, Dear Reader. No, he decided to call it marmie, the same way our brethren down under in Australia refer to a barbecue as a barbie. You get the idea . . .
spooned atop crème fraîche on a cracker. It's even better than caviar! Since I had never made marmalade before, or jams or jellies for that matter, I had no idea how much work it would be to make my kumquat marmie, nor what a tiny amount of the treasured jam would result from all my labors. I found the recipe for my kumquat marmie on David Lebovitz's marvelous blog about living and cooking and eating in Paris. I've been following his blog for some time now, and I enjoyed reading his book The Sweet Life in Paris. In making my batch of kumquat marmie I fiddled with his recipe a bit. I had more kumquats than the recipe called for (our little tree is quite the producer of fruit), and I used a bit less sugar. Being a complete neophyte at making preserves, Reggie was surprised to learn what a considerable undertaking it is to make a batch of marmalade. It took him several days and many, many hours spent slicing, de-seeding, and cooking the mixture of kumquats, lemons, and sugar the recipe called for in order to produce his kumquat marmie. 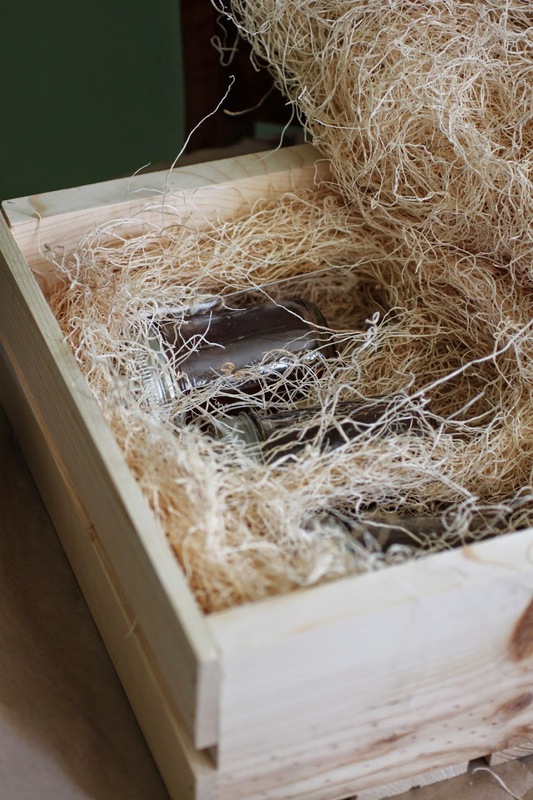 It was hardly what I'd call drudgery, though, as I enjoyed the project from beginning to end, and making the marmie filled our city apartment (I made it during the week over several evenings after work) with a wonderful citrusy scent. 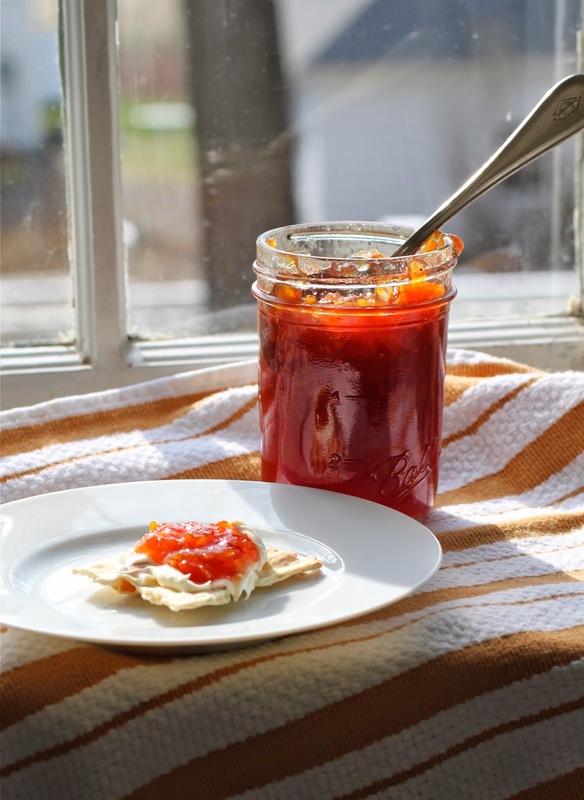 The resulting marmalade is marvelously tangy, tart, and puckery—much like a sourball candy. Spreading it on a hot toasted and buttered English muffin, or on a cracker with cream cheese, one truly appreciates what the expression "food of the gods" means! My second surprise when making my kumquat marmie was how little of it all my efforts produced—just three diminutive six-ounce jars! I had assumed that I'd have at least four or five jars of it, but sadly that was not the case. Given all the time and labor involved, I consider those three jars to be as precious as if I had made them from platinum instead of kumquats! Actually, there are now only two jars of it left. I've already consumed one of them. 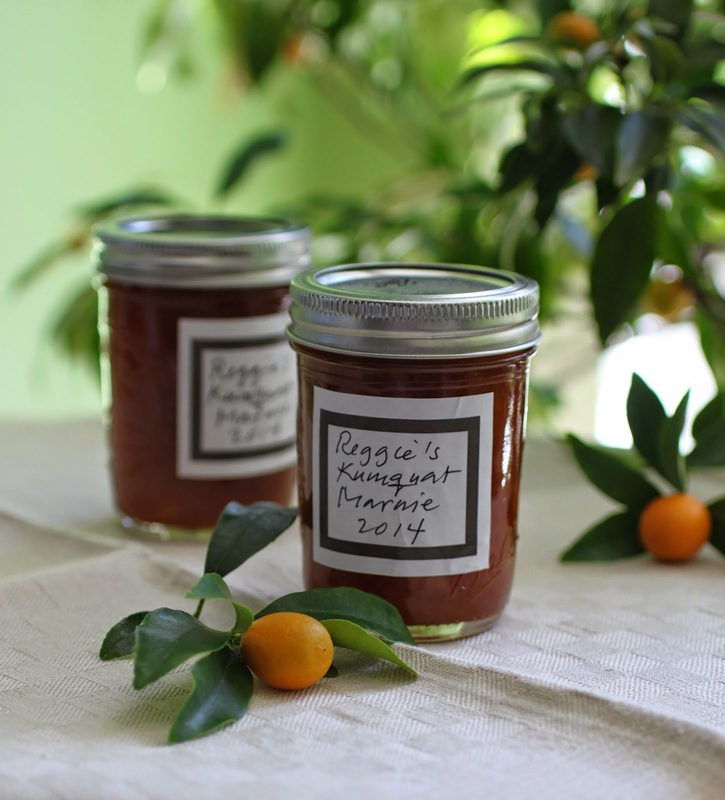 This weekend I am going to mail the two remaining jars of my kumquat marmie to my friends Katherine and Chronica Domus, returning the favor of their thoughtful gifts to me of their homemade marmalade, thus completing the Great Marmalade Exchange. By the way, next year I plan on making a larger batch of kumquat marmie as I have others I'd like to send it to as well. 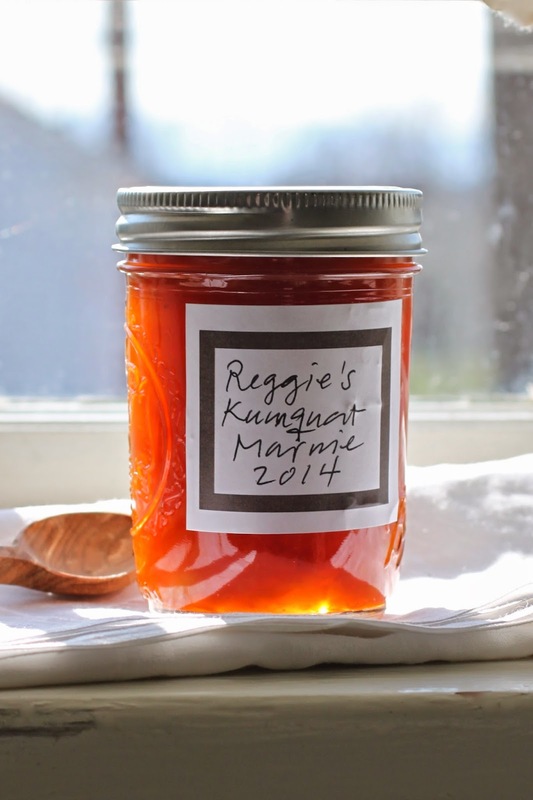 The first and foremost on my list is Ms. Meg Fielding of Pigtown Design blog fame, who has given Reggie two jars of her delicious homemade jams in the last year and who was supposed to get one of his kumquat marmies . . . at least when he assumed that he'd produce more than only three little jars of it. Oh, and what about the marmalade I received from Chronica Domus? So far I've only opened one of the three jars she sent, of blood orange marmalade, and it is absolutely out-of-this-world delicious! I look forward to trying the the two other marmalades she sent, too, one made with Seville oranges and the other with grapefruit and bergamot. Now that I'm officially smitten with homemade marmalade, I'm afraid that I'll never be able to look at dear old Keiller's Dundee with quite the same ardor as I had before . . .
Tell me, Dear Reader, do you like marmalade, too? Have you ever made it? 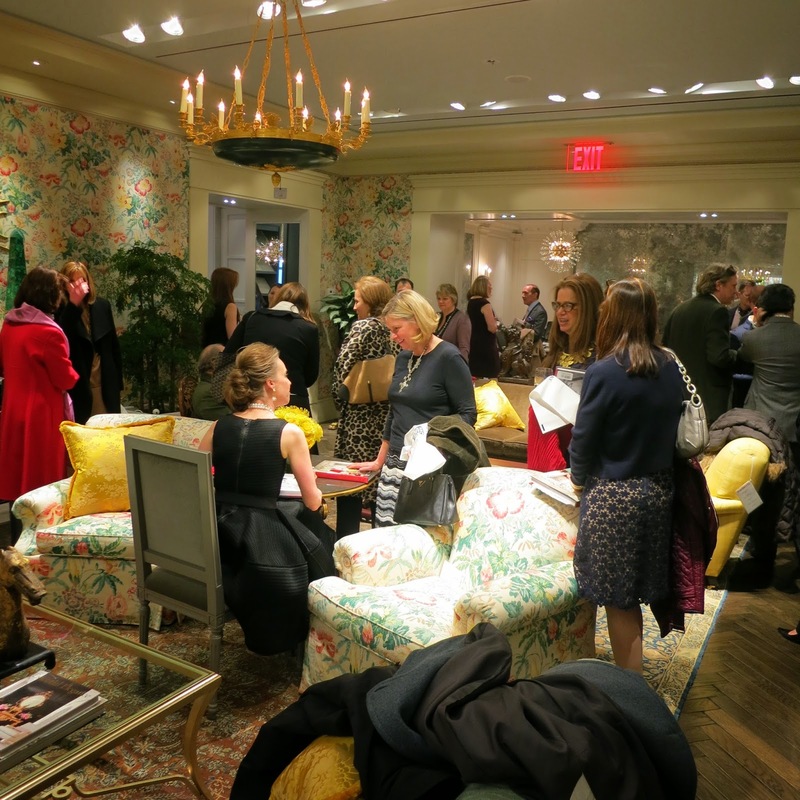 As many readers of this blog well know, Reggie has a penchant for attending book signing parties, particularly ones that celebrate the authors of beautiful design books. 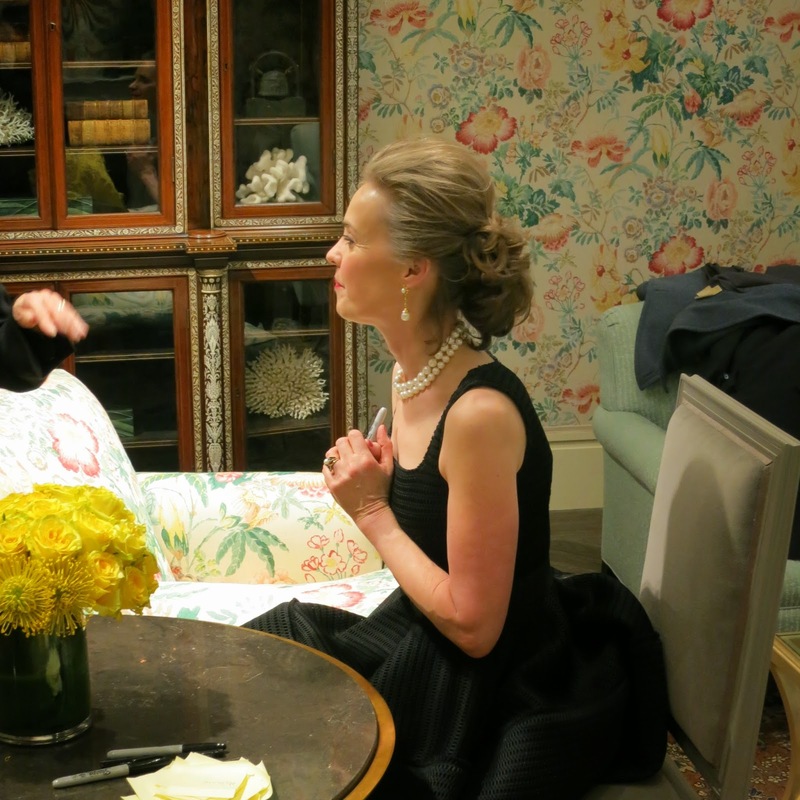 Last night he attended one in honor of Ms. Maureen Footer and her just-published book, George Stacey and the Creation of American Chic. 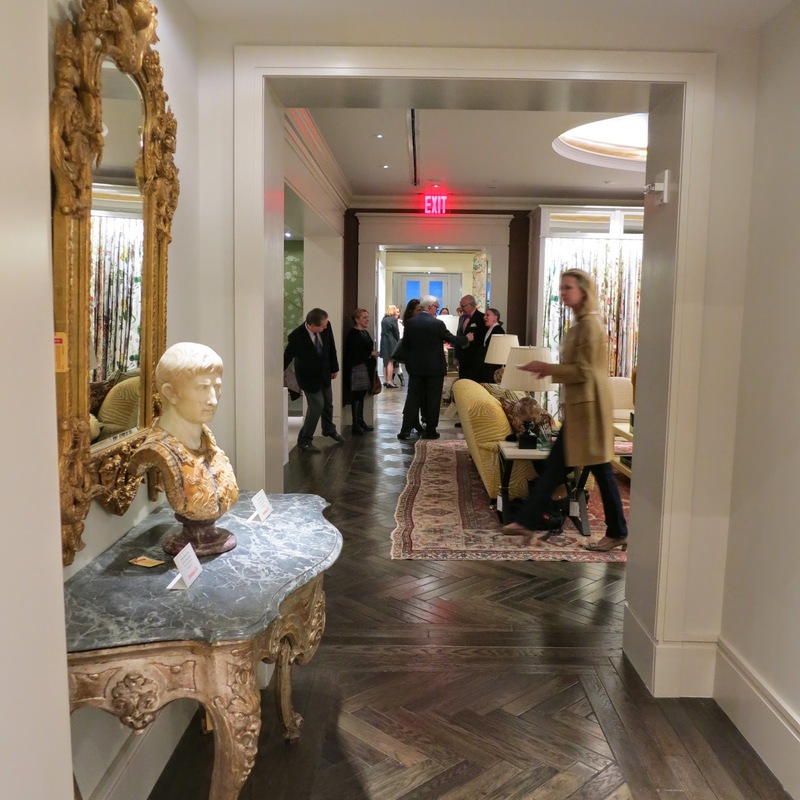 The party was held at New York's D&D Building . . .
. . . in the gorgeous new showrooms of Brunschwig & Fils. 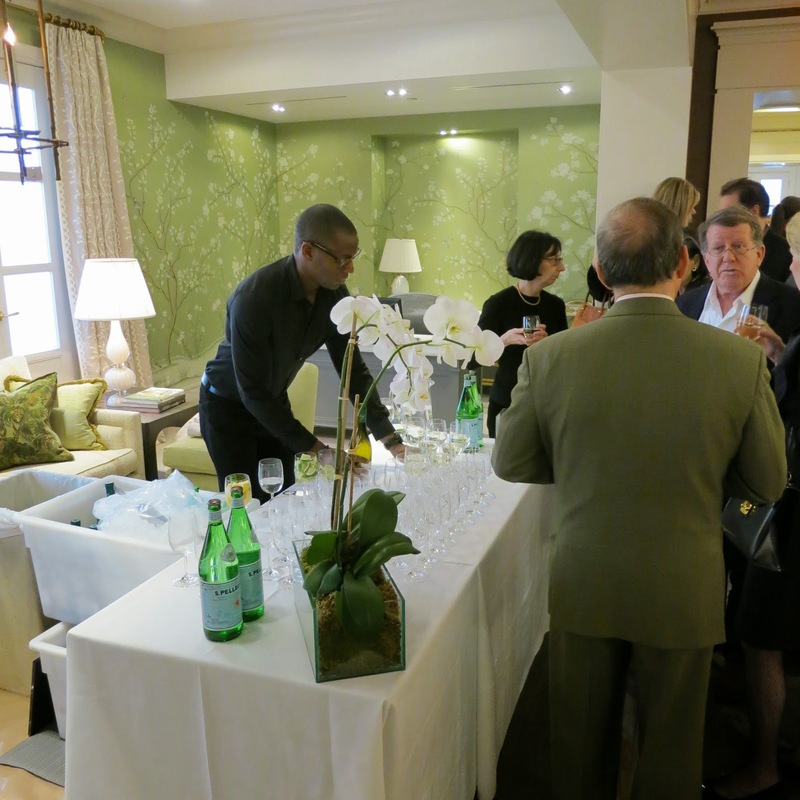 The party was very well attended by members of the design communities and friends of the author. Ms. Footer is one of the most cultured and lovely people I know. She was exquisitely turned out for the party, beautifully coiffed and bejeweled. 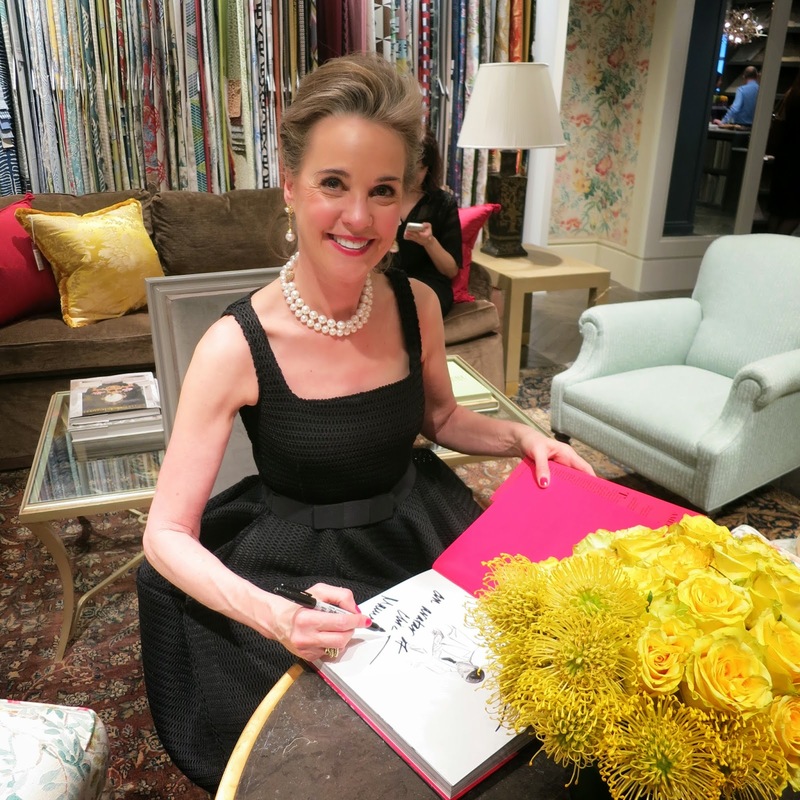 She is one of the nicest people in New York, where she sits at the helm of her eponymously named decorating firm, Maureen Footer Design. She's clever, amusing, and elegance personified. And yes, Dear Reader, she is very chic. 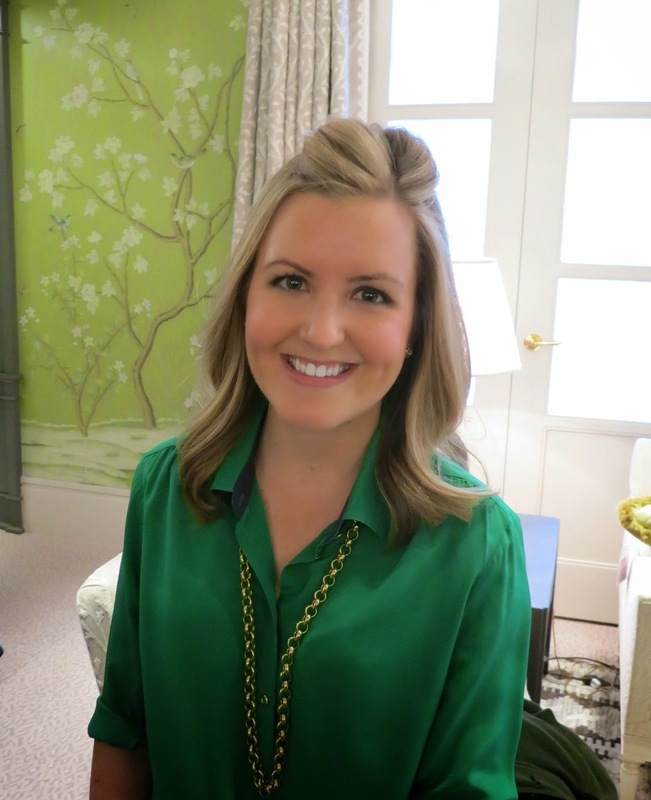 Furthermore, Ms. Footer is highly intelligent, classically educated (she is a graduate of Wellesley College and holds advanced degrees from Columbia University and École du Louvre), and has an engaged and curious mind. While she is firmly rooted in a rarefied world of beauty and refinement, her boundaries stretch far and wide, and she is eager to take in new experiences and explore new places and ideas. I feel supremely fortunate to count her as a friend. She is, in a word, divine. Joining Ms. Footer at the party was His Eminence, Mr. Mario Buatta. He wrote the foreword to her book. They have been friends for many years. I like Mr. Buatta, and I find his droll company amusing and thought-provoking. They broke the mold on that one, Dear Reader. Reggie is very pleased to have had his copy of George Stacey and the Creation of American Chic inscribed by both Ms. Footer and Mr. Buatta. 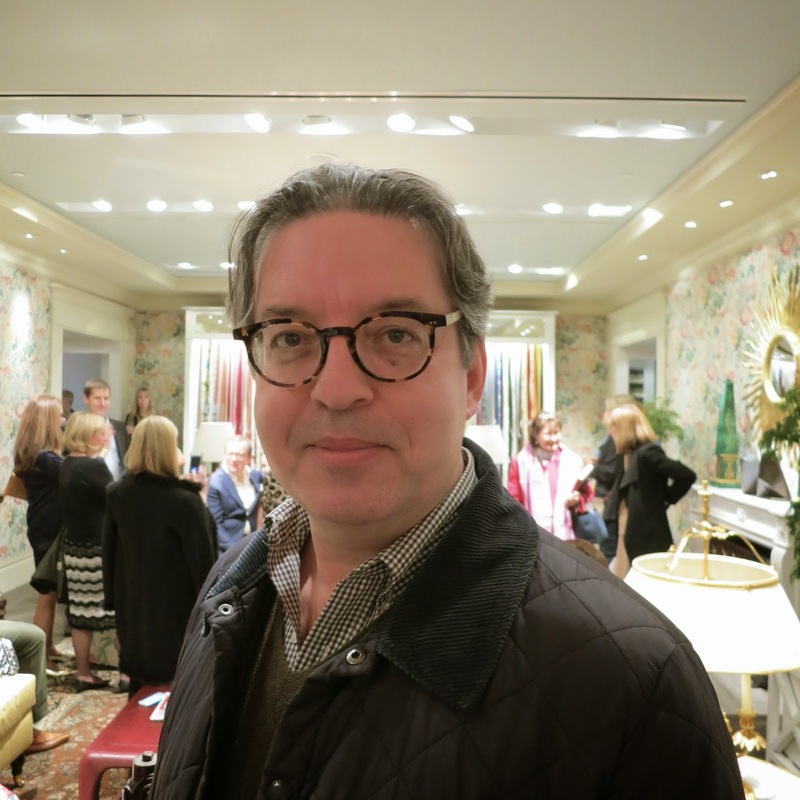 After paying his respects to Lady Footer and His Eminence, Reggie went on a search for a drink and to check out the Brunschwig & Fils showroom, and also to see who else was at the party. He is happy to report that the event was well supplied with wine as well as tables laden with cheese, delicious cured meats, and tasty nibbles. Everyone appeared to be having a delightful time. Two of the first people Reggie came across that he knew were Ms. Dolly Lewis and Ms. Amanda Walker, Boy Fenwick's talented and fun assistant designers. Reggie is very fond of them both. 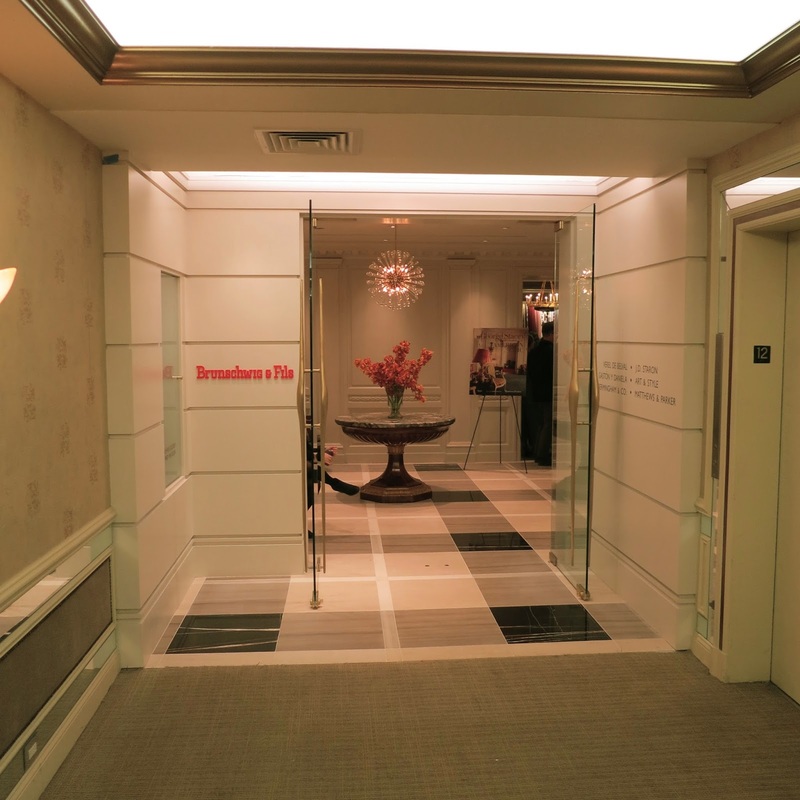 In touring the Brunschwig & Fils showroom, which takes up a large portion of one of the floors in the D&D Building, Reggie came across a delicious tented room that caught his fancy. He learned that the tables in it had been piled high with copies of George Stacey and the Creation of American Chic. They flew off them during the party. The young woman sitting on the banquette was there to take orders for copies to be sent later by Potterton Books. You can order one for yourself, Dear Reader, from Rizzoli USA, the publisher of the book. I've had my copy of George Stacey and the Creation of American Chic for over a week now. It is beautiful to look at and chock full of marvelous photographs and drawings of Mr. Stacey's chic interiors and their aristocratic inhabitants. But it is much more than a pretty coffee-table book. Unlike so many decorator books that are rolling off the presses these days, Ms. Footer's treatise on George Stacey's work is a scholarly, deeply researched, and thoughtful exploration of the designer, his importance to the field, and his influence on subsequent generations of decorators to this very day. 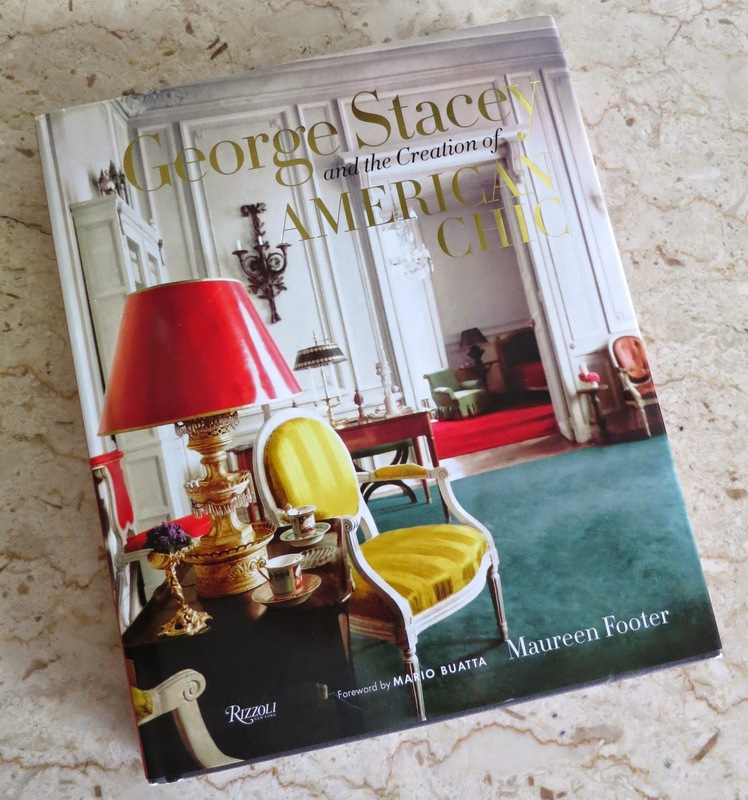 With the publication of Ms. Footer's book, George Stacey is finally getting his due, and his estimable place in the world of modern-day decorating is now realized. I expect George Stacey and the Creation of American Chic will become an influential source of inspiration for those in the field for many years to come. It certainly deserves to be. I highly recommend that you add a copy of Ms. Footer's book to your library, Dear Reader. I am confident that you will find yourself returning to it again and again, as I have done in the short time I've owned it. Turning around I was pleased to find and speak briefly with Mr. Mitch Owens before he slipped out the door for another obligation. 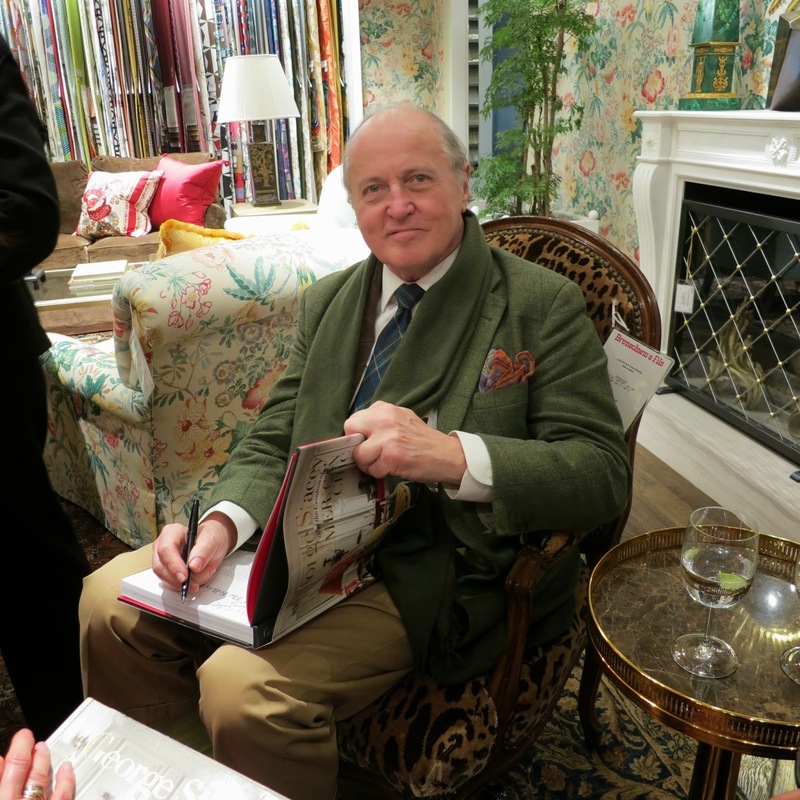 I am delighted to know him and will always owe him a debt of gratitude for the marvelous story he wrote about our house when it was featured in Architectural Digest, where he is the Decorative Arts & Antiques Editor. And who should I come across next, but Mr. James Andrew, of What Is James Wearing? fame. I often see him at such parties, and I always enjoy stopping and speaking with him. He is very amusing and a pleasure to talk with. 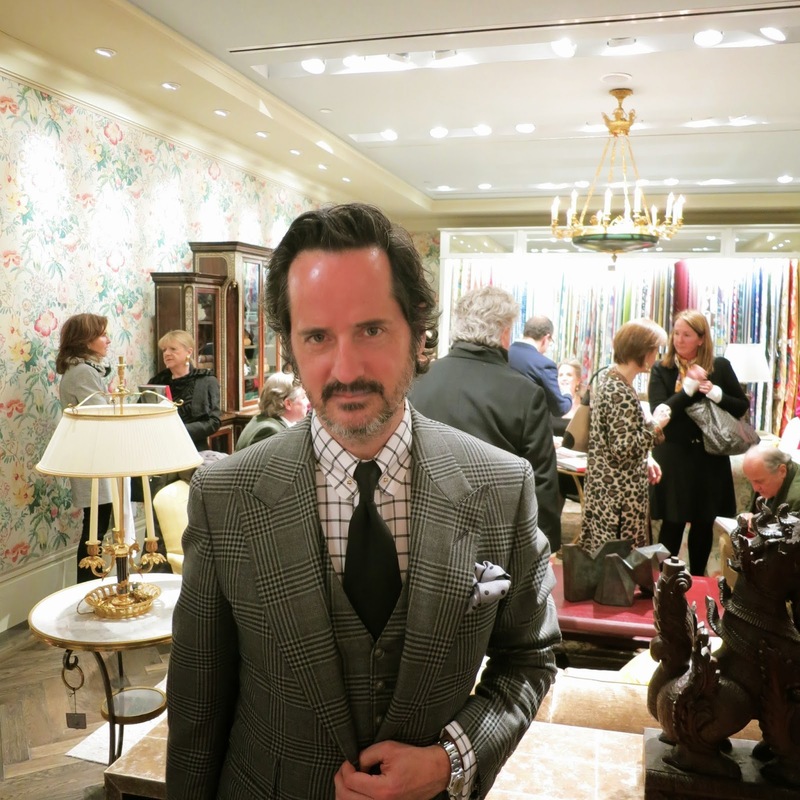 I am happy to report that the new Brunschwig & Fils showroom stays true to its origins, with much of the fabrics on display colorful and patterned. The place was flowing with chintzes, toiles, and printed fabrics, each one of them more beautiful than the next. Thank goodness the new owners of Brunschwig have not turned the venerable fabric house into yet another promoter of beige boringness. Reggie throughly agrees with what the Miss Prescott character in the movie musical Funny Face famously instructed her magazine's readers to do, which is to "Banish the beige!!" 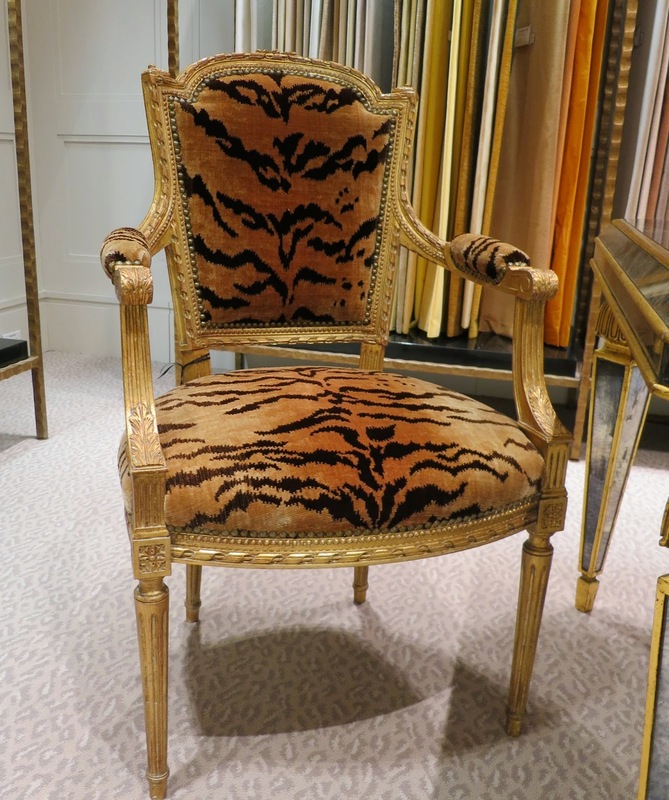 Of course I had to take a photograph of this gilt Louis XVI-style fauteuil, covered in Brunschwig's iconic tiger-patterned silk velvet. Scrumptious! And another snap of a rainbow of velvets. It is such a relief to see color after a long winter! I next came across Ms. Laurie Scovotti, who used to work for Boy Fenwick as an assistant designer before moving to Chicago. I'm glad to report that she has moved back to New York. It was fun catching up with her at the party. I also enjoyed meeting and chatting with Mr. Jeff Petre of McKinnon and Harris. If you are not familiar with the company's estate, garden, and yacht furniture, I suggest you check out their website. I first came across McKinnon and Harris' outdoor furniture more than twenty years ago and have aspired to owning it ever since. It is exquisite. There were any number of people that I stopped to speak with at the party but did not photograph. Reggie is not, after all, a professional photographer or recorder of such events, Dear Reader, but rather a happy-go-lucky participant in the fun of the social swirl. I was pleased to run into Mr. Brian Sawyer at the party. I first met him many years ago shortly after he arrived in the city when he was an associate at Robert A. M. Stern. 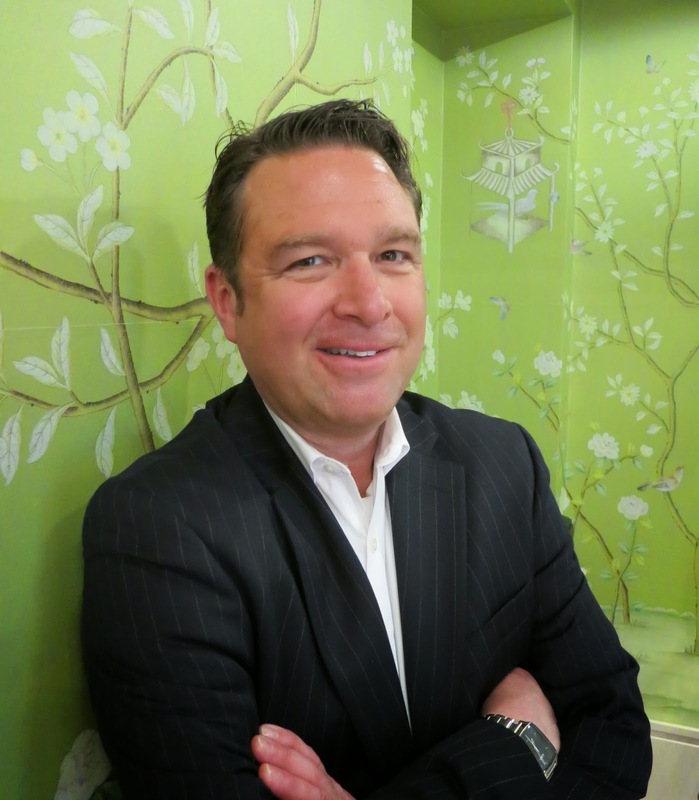 He has since gone on to become a celebrated architect and landscape designer. Everywhere one turned at Brunschwig there was something to delight the eye. I loved the Venetian blown-glass chandelier in the preceding photograph. I next stopped and spoke with Ms. Ashleigh Rich and Mr. Jonathan Tait, shown above. I initiated the conversation because I was wearing what was virtually the same outfit as Mr. Tait, of an orange Hermes tie, a blue-and-white checked shirt, and a navy blazer. 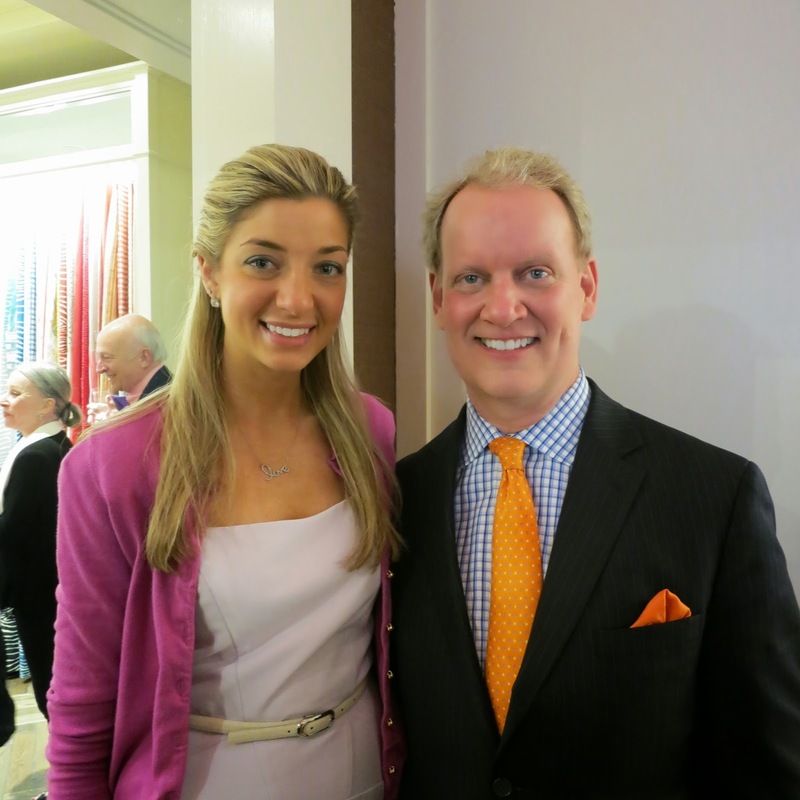 Ms. Rich works for Kravet, the parent of Brunschwig & Fils, and Mr. Tait works at Scully & Scully. I enjoyed meeting them, and found them charming and fun. 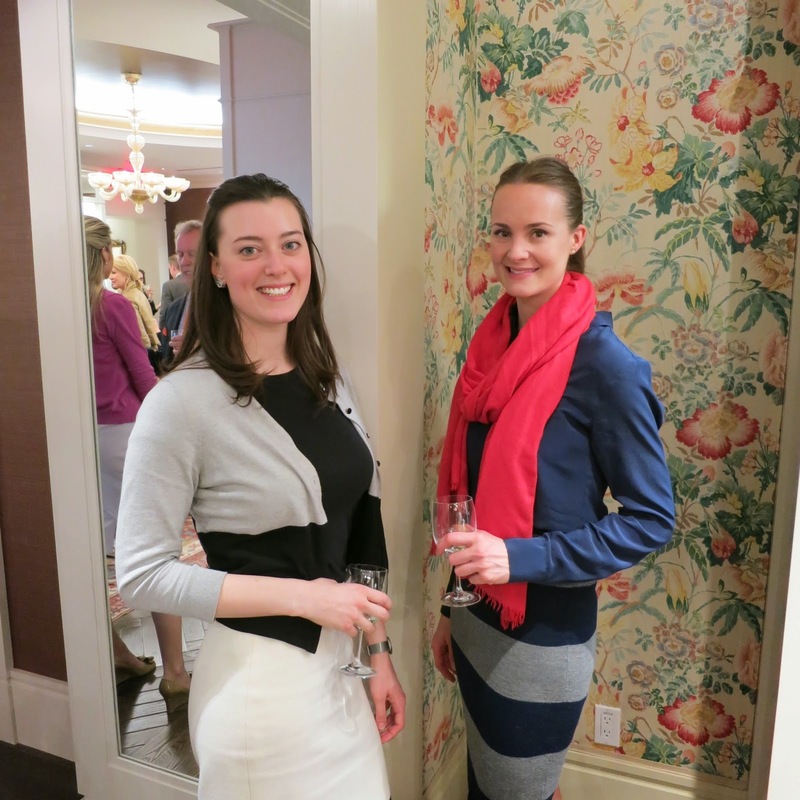 Here's another shot of happy revelers milling about in the impossibly pretty Brunschwig showroom. 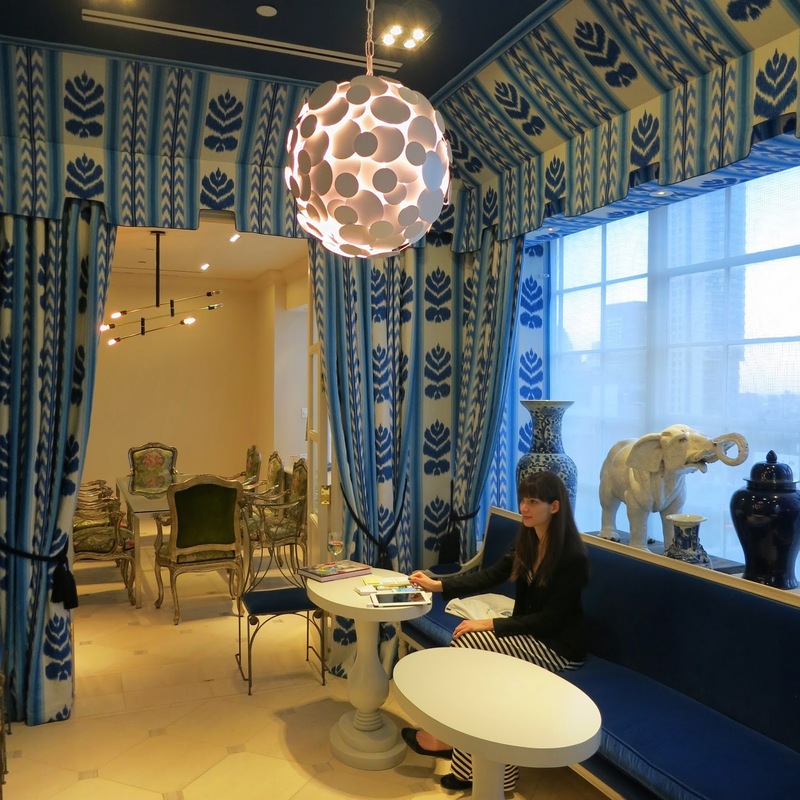 The showroom is arranged as an enfilade of rooms, each one more elegant than the other. Peeking my head into one of them, whom should I come across again but Ms. Dolly Lewis, Ms. Amanda Walker, and Ms. Laurie Scovotti, Boy Fenwick's current and former assistants! Mr. Boy Fenwick himself soon arrived, and the four of them started flipping through the wings of lovely fabrics on display. 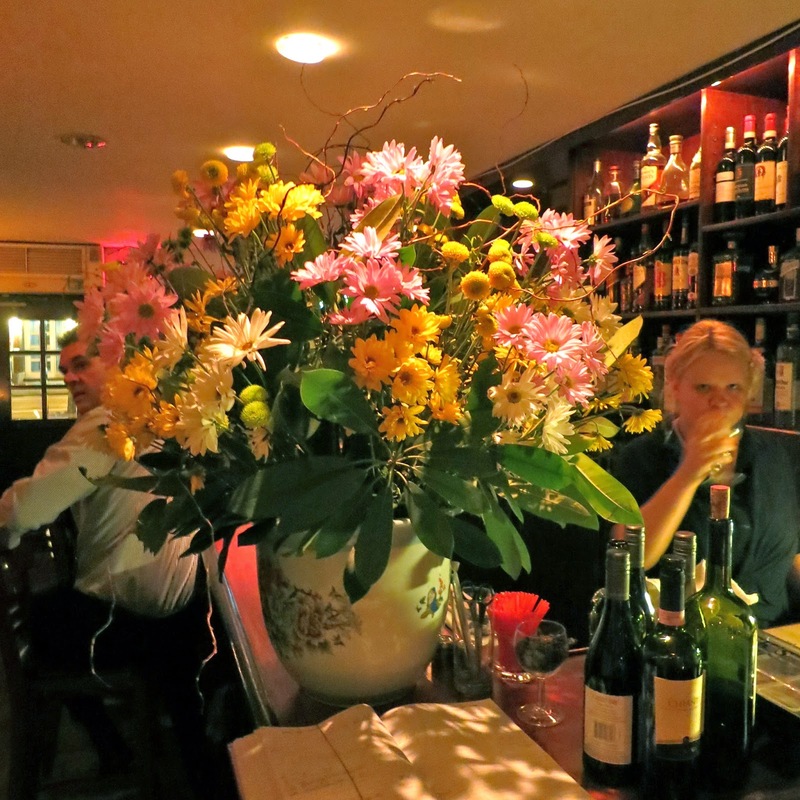 The five of us then decided that dinner was most defintely in order, so we retired to the nearby Canaletto Restaurant, on East 60th Street, where we had a jolly time of it indeed. Ah, what a wonderful few hours I had last night, and how fortunate I am to have such an accomplished friend as Ms. Maureen Footer to celebrate and a bevy of others to join me in doing so! I've got to get something off my chest, Dear Reader. I am supremely weary of hearing people drop the F-bomb. It seems that almost every place I go these days I hear someone using it over and over in casual conversations, in restaurants, at work, in stores, everywhere. It's almost as prevalent as the mind-numbing use of "like," "uh," and "um" as conversation filler. But it is far worse. While those three words may be grating to listen to when repeated endlessly in conversation, they are but tedious only. 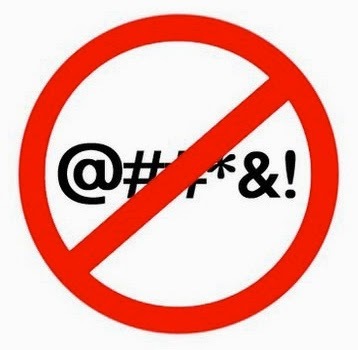 Flagrant use of the F-word, on the other hand, is rightly frowned upon by people of refinement and banned from broadcast airwaves (at least for now) for a reason: it is intensely and vividly vulgar. I believe its use should be reserved for situations and circumstances that are either private or where the speaker has been provoked to the point of explosion. And it most certainly shouldn't be used within earshot of children. Don't get me wrong, Dear Reader, Reggie is not a prude. He has been known to use the F-word himself, along with other pithy Anglo Saxon expletives. He acknowledges that doing so can at times be very satisfying, indeed. 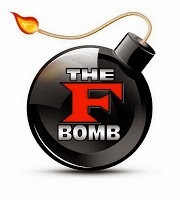 However, he believes the use of the F-bomb in general conversation today has become so prevalent and gratuitous as to have lost its potency, at least in the minds of those he overhears using it repeatedly and unblinkingly in public. If they stopped to actually listen to themselves, as Reggie is often forced to against his wishes, he believes they might be surprised to hear how crude and unattractive they sound. And how unimaginative—can't they think of any other words to use? Maybe not. At least that's what he concludes when he casts a gimlet eye on many of those he overhears using it in public. But that's not always the case, Dear Reader. Reggie is often surprised when he turns to examine who is speaking so fouly to find that it is a person who should know better. They have fallen into the habit of using the F-word unthinkingly, with no comprehension that it does not reflect well upon themselves (to say the least), nor do they have any consideration that others might find it unpleasant—if not offensive—to listen to. When I am out in public, Dear Reader, I do not like hearing other people repeatedly use the F-bomb or other rude expletives, particularly strangers at other tables in restaurants, in lines at stores, in places of entertainment, or while walking about the streets of the city in which I live. I find it ugly and intrusive. So I make every effort not to drop the F-bomb or use other obscenities in public. Sometimes I slip up, though, because I am far from perfect. But I try to be sensitive to the fact that there are people within listening distance who may find such language offensive, and so I refrain from using it in public whenever possible. I think the world would be a better place if more of us did the same, too. Tell me, Dear Reader, what do you think? Several years ago I wrote a post about my affection for barrel-shaped objects. I'm drawn to them, Dear Reader, and have collected them for as long as I can remember. I find objects made in the shape of old-fashioned barrels pleasing, both to look at and as sweet reminders of pre-industrial times. All sorts of barrel-shaped vessels are to be found if one keeps one's eyes open for such things. Most that I come across date from before the 1950s, when plastic containers became ubiquitous and, well, ruined everything. We recently came across an assortment of little barrel-shaped vessels for sale at White Whale Limited, one of our favorite antiques shops in Hudson, New York. Owned and operated by two generations of the Ribar family, White Whale is a required destination of ours in Hudson and a place where we have had great good luck finding wonderful things for Darlington House, ranging from vintage Christmas ornaments to early neoclassical Staffordshire figures. We rarely come away from a visit to White Whale with nothing in hand. 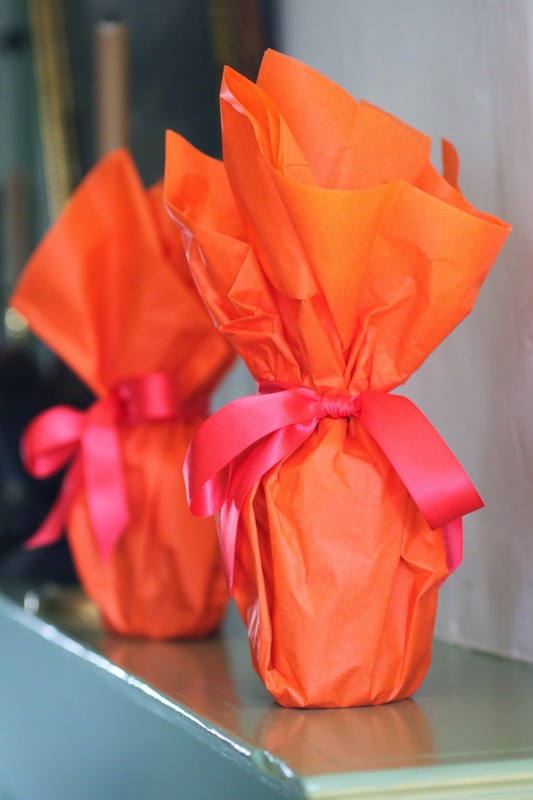 Among the numerous little barrels for sale we chose the three small ones shown in this post. 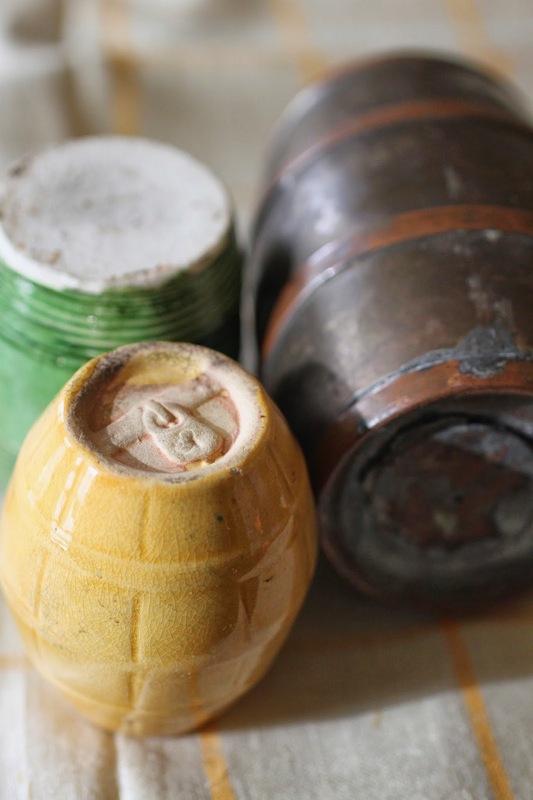 Two are made of glazed earthenware and one is made of mixed metals. 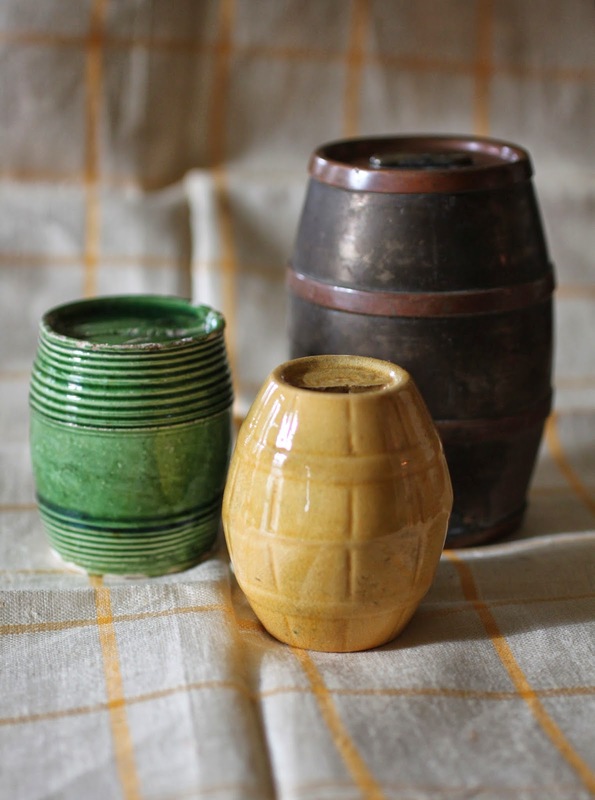 The green and yellow barrels stand about three inches tall; the larger metal one is approximately five inches tall. All three were made to squirrel away coins. 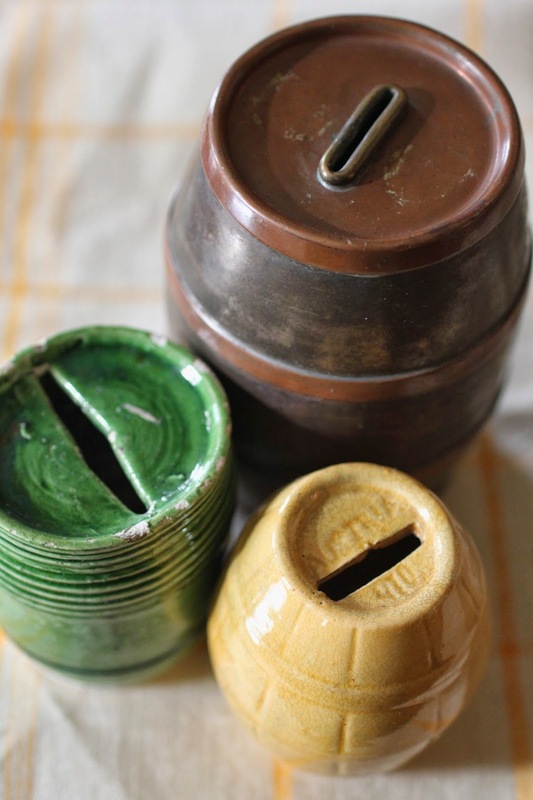 They were fortunate to avoid the fate of many a child's piggy bank: smashed to shards to cash in the treasure within. I believe our little barrels date from the mid-nineteenth century to the early twentieth century. Monday - Sunday 11:00 a.m. to 5:00 p.m.
One of the joys (and responsibilities) of Darlington is that it has a number of buildings on the property. Four, to be specific. In addition to the brick and clapboard main house there are two wooden barns—one originally designed to hold a carriage, and the other for farm equipment and livestock. There is also a brick workhouse built for doing laundry and cooking in warmer weather. All the structures on the property date from the first decades of the nineteenth century and are original. Since buying Darlington more than fifteen years ago we have done a lot of work to the buildings and grounds. Not only did we want to, Dear Reader, as we believe it is our responsibility to sensitively care for such treasures, but their deteriorating condition required it. As I wrote in my introductory post on Darlington, the condition of the house and property was one of benign neglect when we bought it. The previous owner, Mrs. Proctor, was in her late nineties at the time and had been living in what is euphemistically referred to as "a home" for several years. Darlington had sat empty for five (or more) years, used only occasionally by relatives when visiting the area. The barn one month later. Work has begun. Note absence of chimney on right hand side of the roof . . .
During their ownership of Darlington, the Proctors, people of means who appreciated the historic significance of the house and property, took good care of it. However, by the time we bought it from them little had been done to the house or grounds since the 1970s, other than putting up an occasional coat of paint and regularly mowing the lawns. Darlington had become a sleeping, overgrown beauty, drifting into decay . . .
Our first priority was to focus on the main house, which required major and extensive restoration, and also a complete updating of all of its systems. As the urgency of those repairs subsided, we turned our sights to the other buildings on the property. 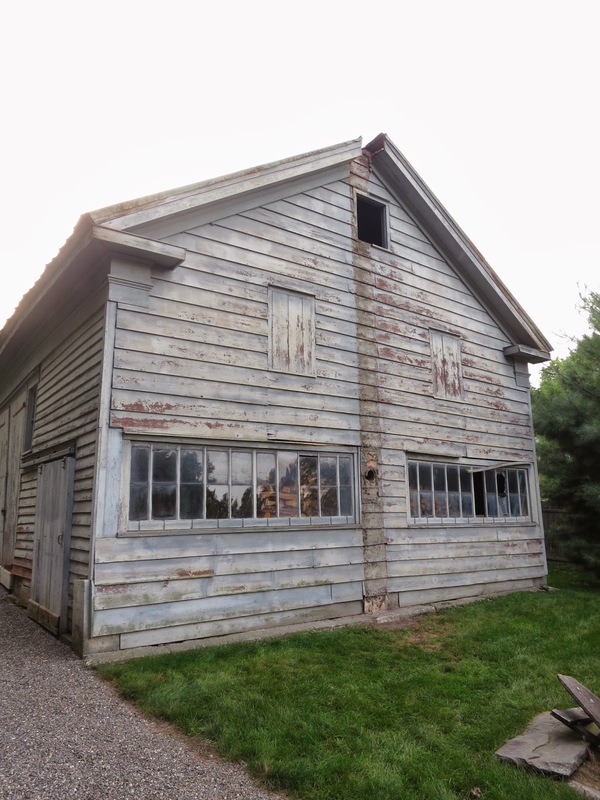 Our next project was a ground-up restoration of the carriage barn, which we have repurposed as a gardening barn, filling it with tools and rakes and enough Guy Wolff clay pots to keep a nursery happy for years. We have also done a substantial amount of restoration to Darlington's work house and hope to have it completed later this year when the fellow who has done the work on it so far frees up from other commitments. More recently we have turned our attention to what we call the "large barn" at Darlington. It was built in around 1840 as a working barn and originally held the property's farm machinery and equipment, along with the livestock that was used in managing the 165 acres that Darlington once encompassed. Today it is where we keep our cars, large clay pots in the winter, stacks of firewood, and our refuse and recycling containers. In other words, it functions as a large modern-day garage. So why did we wait so long to tackle the large barn's restoration, you might ask, Dear Reader? There were several reasons. First, the financial crash of 2008 happened, which put the brakes on my interest in taking on such a large project, and second, it took us for ever to decide that we didn't need to do as thorough (and expensive) a restoration to the barn as we have done to the other buildings on the property. 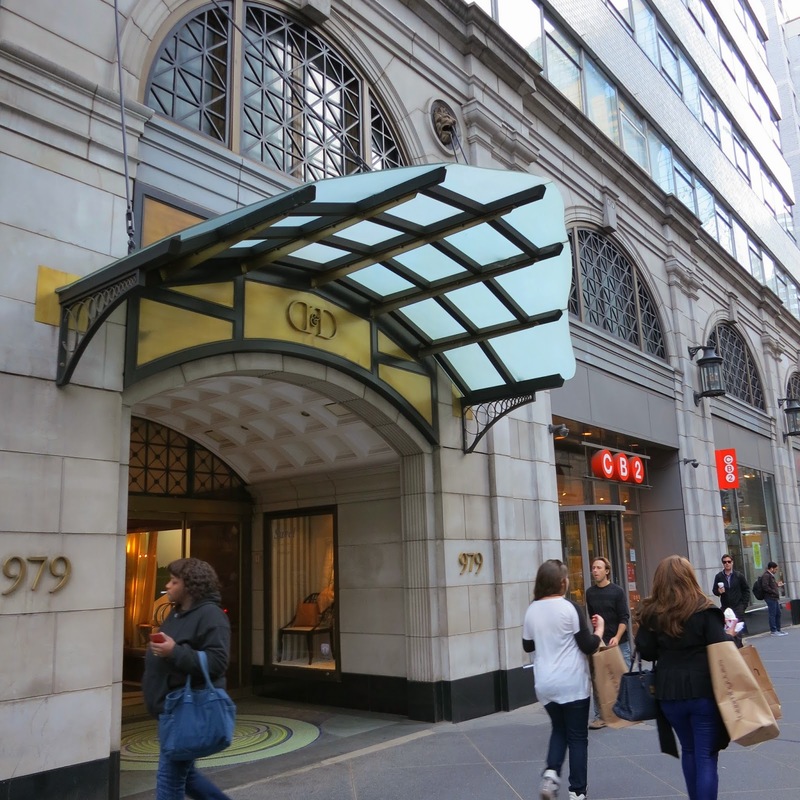 Rather, we decided that it was sufficient (and less financially punishing) to do a careful and thoughtful shoring up of the structure, replace its later, less-than-successful remuddlings, and update the building's systems for modern-day requirements. When we are finished we will have returned the barn to a close approximation of what it looked like when it was originally built almost 180 years ago. Over the next several months I plan on posting about the barn's ongoing restoration and updating. I am confident that when the work is completed the barn will, once again, be the handsome and dignified structure it once was and was always meant to be. Won't you please join me in my journey?